Algal blooms have gotten a bad rap over the past few summers—but not all are toxic. Some are totally normal. 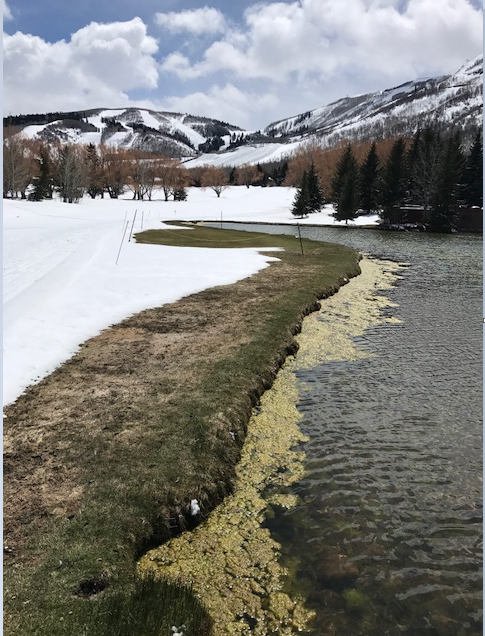 If you happen to wander by the pond at the Park City Municipal Golf Course’s 14th hole, don’t be alarmed by the brownish-green slime you see floating at the top. A combination of fertilizer nutrients and sunshine has resulted in the formation of an algal bloom. Summit County Environmental Health Director Phil Bondurant says it’s just a part of the transition from winter to spring. It’s not a harmful bloom, like the cyanobacteria-based ones in Rockport and Echo Reservoirs last summer. Bondurant says that type of algae even looks different. Bondurant says blooms this time of year aren’t indicative of any problems down the road when warmer weather arrives, and because it’s surface algae, it won’t have any effect on the surrounding groundwater. Still, though, Bondurant advises against drinking or playing in the water.